April 24, 2015 - Another month with no trips to get fast food. We did, however, go down the cereal aisle at the grocery store several times! 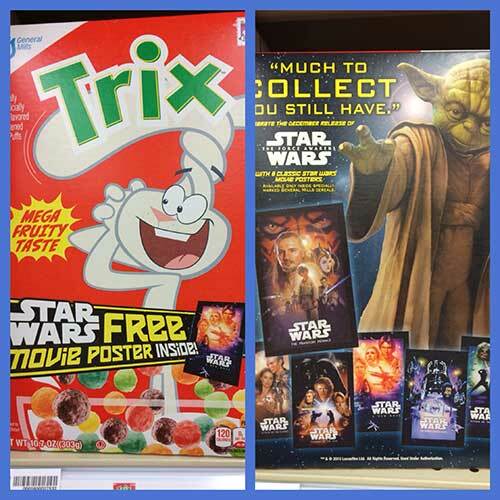 There are lots of big movies coming out soon, which means many movie tie-in promotions on cereal boxes. 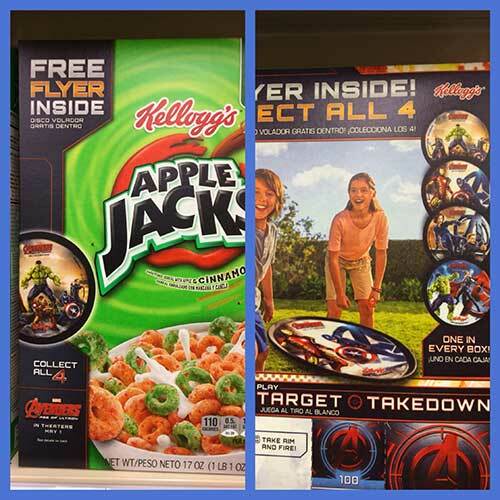 On your next trip to get groceries, take a few extra moments to check it out - there are offers for free movie tickets as well as freebies packed into some of the boxes. - McDonald's has a joint promo of Transformers and My Little Pony: Equestria Girls in their Happy Meals. The next promotion shown is a joint promo of Littlest Pet Shop and Skylanders. The McDonald's McPlay app has free ebooks in it as well as a game. The ebooks are also available on their web site. - Sonic has seven different Superman toys that they are promoting in their Wacky Pack meals. - The Chick-fil-A site shows Explorer activity toys as the goodies in their Kid's Meals. The under 3 toy is a board book. - The Wendy's site is featuring Annie toys in their kids meals, with Smart Links coming soon. The under 3 toy is a board book based on Yo Gabba Gabba. - Burger King has brought back their kids meal web site, and they are featuring Scholastic books at the moment. - Subway Kids Meals have six different Avengers 3D Play Kits, these appear to be paper/cardboard toys to assemble and topple. - The Carl's Jr. and Hardee's both have Penguins of Madagascar toys and activities. Starting in the middle of June, the promotion changes to Bass Pro Shop Kids. - The Captain D's web site does not currently list the toy in their kids meals. - Arby's has revamped their web site and it doesn't seem to show the toy anymore. - Taco Bell has phased out Kids Meals and their Kids Menu. Most of the items will still be available on their regular menu, but will no longer be marketed as for kids, so really the only difference is that the toys are gone.